Medium Circle Medium Circle Pet ID Tag  - $7.00 : Your Pet Store, Made in the USA! This is a tag in the shape of a circle and is available in brass, or gold, only. The picture of the tag is the actual size of the tag. The measurements of the tag are 1 1/8" wide and 1 1/8" tall. This tag is appropriate for dogs over 20 lbs. 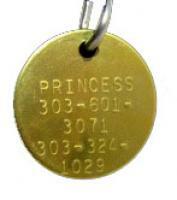 The gold color is solid brass, and is the most durable material for a pet tag. The printing on the tag is stamped in, so the printing will stay visible.